Quality specifications for herbs and spices; Quality indices for spice essential oils; Organic spices; Aniseed; Bay leaves; Black pepper; Capisicum chillies, paprika, bird's eye chilli; Cardamom (small); Cardamom (large); Cinnamon; Clove; Cumin; Curry leaf; Dill; Garlic; Ginger; Kokam and combodge; Marjoram; Nutmeg and mace; Onion; Poppy; Rosemary and sage as antioxidants; Saffron; Tamarind; Turmeric. Herbs and spices are among the most versatile and widely used ingredients in food processing. As well as their traditional role in flavouring and colouring foods, they have been increasingly used as natural preservatives and for their potential health-promoting properties, for example as antioxidants. Edited by a leading authority in the field, and with a distinguished international team of contributors, the Handbook of herbs and spices provides an essential reference for manufacturers wishing to make the most of these important ingredients. The first group of chapters looks at general issues including quality indices for conventional and organically produced herbs, spices and their essential oils. 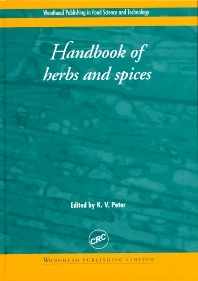 The Handbook of herbs and spices is a standard reference for all manufacturers using herbs and spices in their products.